Choosing a local paving contractor to work on your home or commercial property is an important decision that should not be taken lightly. It is imperative that you find a paving contractor that provides high quality work and is reputable, dependable and trustworthy. If you search the Internet, you will find many paving contractors who advertise their services. However, you may find that only a small percentage of these companies actually service your particular geographic area. That is why it makes so much sense to use the Find Local Contractors Directory to find a qualified paving contractor in your local area. All of the paving contractors listed in the Find Local Contractors Directory serve your local area so there is no need to go through and eliminate national companies who do not serve your geographic area. Find Local works diligently to ensure that only the best and most respected businesses in your area are listed in our directory. Companies pay to advertise in our directory so you can rest assured they are serious about their businesses. At Find Local, we have worked hard to ensure that your user experience is positive. As such, our pages are free of clutter and are kept up to date with the latest information. You can quickly browse through the local paving contractors listed to choose the ones that you would like to research further. For top quality residential and commercial paving services in your local area, consult the Find Local Contractors Directory. Our directory provides a quick and easy means for finding a local paving contractor to handle your commercial or residential paving needs. Sunshine Services Unlimited, Inc. is Martin County’s premier asphalt paving contractor. We are a family-owned and operated asphalt paving company located in West Palm Beach and serving commercial and residential clients in Martin County and the surrounding areas. We want to be the company you trust for all of your asphalt paving construction, repair, maintenance and seal coating services. Our company specializes in asphalt roadways, speed bumps, driveways, patios, cart paths, parking lots and much more. Our goal is to provide quality work in a timely manner while being mindful of your property and the environment. If you are looking for experienced asphalt paving contractors serving Port St. Lucie, look no further than Sunshine Services Unlimited, Inc. We are a family-owned and operated asphalt paving company located in West Palm Beach and serving homeowners and commercial property owners in Port St. Lucie and the surrounding areas. Our professional paving company offers high quality asphalt paving construction, repair, maintenance and seal coating services at competitive prices and customer service that is unmatched in the industry. We are fully licensed, bonded and insured and we guarantee our work. As an added service for our value clients, we offer free estimates as well as free consultations. Call us today to talk to one of our experts about your asphalt paving project. 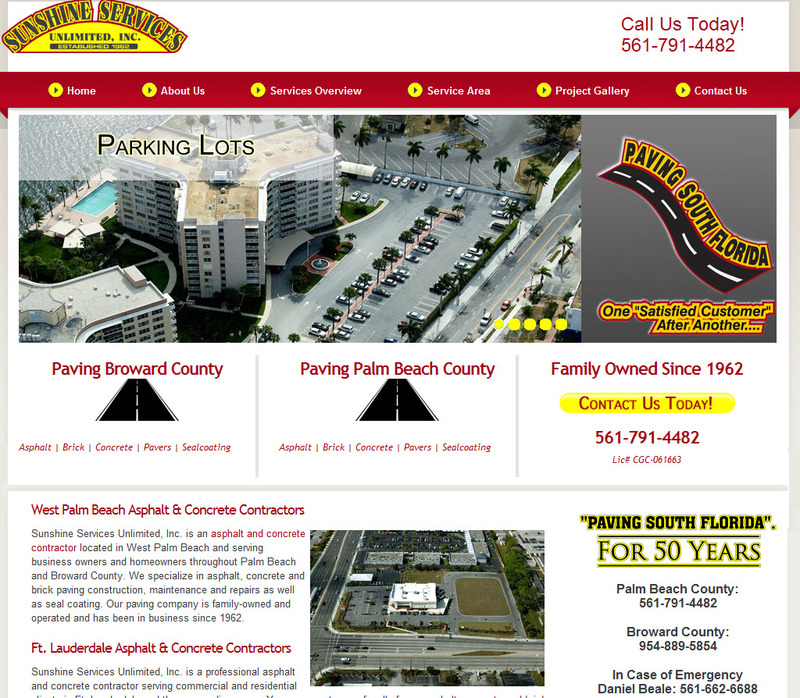 For St. Lucie County asphalt paving contractors you can rely on, turn to the experts at Sunshine Services Unlimited, Inc. Our family-owned and operated asphalt paving company has been faithfully serving commercial and residential clients in St. Lucie County for over fifty years. During this time, we have earned a reputation as a company that provides high quality work, excellent value and customer service that in unsurpassed in the industry. Now we would like the opportunity to earn your business. Because we realize how important it is to find the right contractor for your asphalt paving project, we offer free estimates as well as free consultations. Give us a call today to talk to one of our experts about your project. You will not be disappointed. If you are looking for qualified, experienced asphalt paving contractors serving Stuart, turn to the professionals at Sunshine Services Unlimited, Inc. We are a family-owned and operated asphalt paving company that has served commercial and residential clients in Stuart since 1962. We handle asphalt paving construction, maintenance, repairs and seal coating for driveways, patios, roadways, speed bumps and more. Our asphalt paving company is fully licensed, bonded and insured and we guarantee our work.